MHA Today is provided as a service to members of the Missouri Hospital Association. Additional information is available online at MHAnet. Connect with us on LinkedIn. Celebrate Missouri hospitals by visiting mohospitals.com. The Centers for Medicare & Medicaid Services has issued a new survey and certification memo regarding proposed changes for organ procurement organizations and transplant centers. The memo outlines proposed changes in the recently released calendar year 2017 hospital outpatient PPS. Changes to the OPO system include alignment of the definition of “eligible death.” For transplant centers, the changes include updates to the Medicare conditions of participation regarding acceptable thresholds for one-year patient and graft survival. The July issue of Trajectories discusses the importance of diabetes management. Advancements in diabetes management have focused on better understanding the health equity issues that contribute to poor self-management and outcomes, and identifying and monitoring patients and populations with prediabetes and diabetes. Diabetes-related complication rates are declining, particularly for heart attack, stroke, lower extremity amputations, end-stage renal disease and hypoglycemia-related deaths, which indicates improved overall disease management (Figure 9). Broad efforts to improve screening, prevention and management is a daunting task; however, with an estimated 1 in 5 adults projected to develop diabetes by 2030, now is the time to focus on screening and prevention efforts. These efforts should focus on individuals at the highest risk who receive the poorest care and have the worst outcomes — populations with health care disparities. As more data on race, ethnicity, language and other identified criteria are accurately collected by providers, there is a growing body of evidence regarding the effect of health disparities on overall health. Type 2 diabetes disproportionately affects African-Americans, American Indians, Asian Americans, Hispanics/Latinos, Pacific Islanders and Alaskan Natives. These groups also make up a disproportionate share of the poor and uninsured. 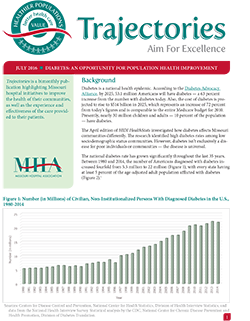 Evidence suggests that black Missourians, ages 65 and older, with less than a high school education, have higher rates of hospitalizations and emergency department visits for both initial diagnosis and ongoing crisis management of diabetes. Additionally, sociodemographic and economic factors, such as living in blighted or extremely low-income neighborhoods; lacking access to quality food and beverages; showing high rates of tobacco, drug and alcohol abuse; and having poor education services have been linked to significant increased risk for diabetes, cardiovascular disease, obesity, early morbidity and mortality. One adverse outcome of uncontrolled diabetes is extremity amputation. Last year in Missouri, black men ages 35 and older accounted for just 2.4 percent of the total population and 11.9 percent of diabetes-related limb amputations — a health disparity factor of 5 over white men, ages 35 and older. The Centers for Disease Control and Prevention urges health care providers and laboratories to remain on alert for infections caused by B. cepacia complex occurring among non-cystic fibrosis patients. Providers and labs should immediately inform infection prevention staff when infections are identified. Although infections caused by B. cepacia complex are known to occur among patients with CF, any clusters of such infections should be reported to state or local public health authorities. The CDC recommends that clinicians not use any liquid docusate product as a stool softener or for any other medical purpose. Missouri is the 10th state to enact the enhanced nurse licensing compact, which allows nurses licensed in one state to practice in all other states that have joined the compact. Senate Bill 635 and House Bill 1816 were signed by Gov. Jay Nixon on July 5. Arizona, Florida, Idaho, New Hampshire, South Dakota, Oklahoma, Tennessee, Virginia and Wyoming also have joined. Elliot Vice, the compact's Director of Government Affairs, expects that more states will enact next year. The compact takes effect when either 26 states pass it or by Dec. 31, 2018, whichever comes first. More information can be found on the National Council of State Boards of Nursing website. The same bills also expanded compact rights to Missouri’s physical therapists. The Federation of State Boards of Physical Therapy website provides additional information. The Pokémon Go app that was released last week for use on smart phones includes some location-specific activities that may lead players to hospitals for gameplay. The game incentivizes interaction with the app at specific physical locations where players can interact with each other or characters. Locations, known in the game as “Gyms” or PokeStops” can be removed from the app by contacting the developer, and filling out a form. Hospitals wishing to remove their location should select “submit a request,” in the upper right corner and then “report an issue with a Gym or Pokestop” in the pull-down menu. By Monday, the app had been downloaded more than 7.5 million times. The Substance Abuse and Mental Health Services Administration has released “State Estimates of Major Depressive Episode Among Adolescents: 2013 and 2014.” Based on combined 2013-2014 national surveys on drug use and health, about 1 in 9 (11 percent) adolescents, ages 12 to 17 across the U.S., had a major depressive episode in the last year — roughly 2.7 million of the 24.9 million adolescents in the nation. This is considered a statistically-significant increase over 2012 results, which were 9 percent. David Isaacks has been named Director of Harry S. Truman Memorial Veterans’ Hospital, effective July 18. 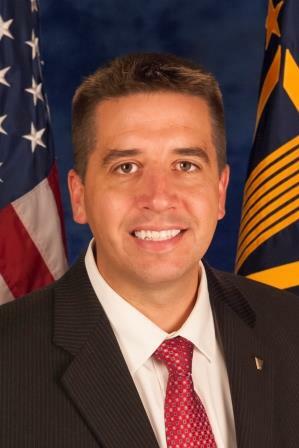 He succeeds Wade Vlosich, who was reassigned by the VA as Director of the Oklahoma City VA Health Care System in May. Isaacks has served as Deputy Director of the VA Sunshine Network in St. Petersburg, Fla., since September 2015. He began his career with the VA in 2006. A list of CEO changes is available online. In the U.S., 6.9 percent of adults (16 million) had at least one major depressive episode in the last year.